After having twins and becoming a family of five, Lucinda and Jamie sold their 1930s house in Crouch End and left London for a bit more greenery and a slower pace of life in Lancashire. A period property appealed, but all the primary schools were full in the villages they’d set their hearts on. However, when a small local developer started building eight detached homes near Preston, they decided to buy a five-bedroom house off plan. Close to the M61 and the airport, it was ideal for Sam’s job managing musicians and DJs, which involves lots of travel. 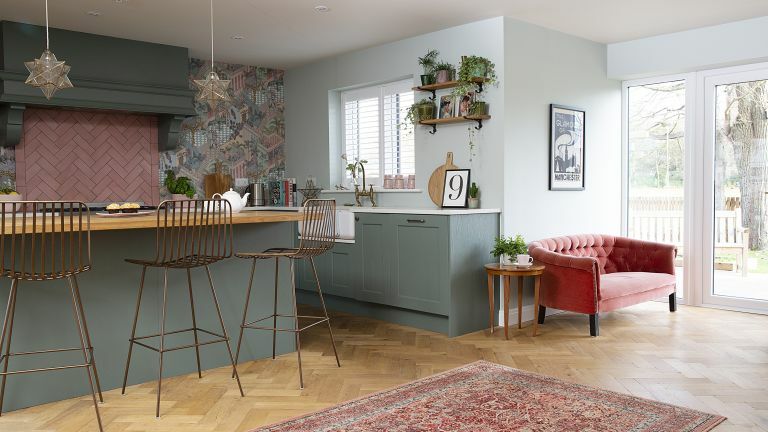 Read on to find out how Lucinda created the country-inspired kitchen-diner at the heart of their new home, and then browse all our real home transformations. Find out how to design an open-plan kitchen in our expert guide, too. The owners Lucinda Holt, a freelance social media and marketing consultant, lives here with her husband, Sam, who works in artist management, and their children, Lola, seven, and twins Violet and Ruby, five. The property A five-bedroom detached new-build house near Preston, Lancashire. Project cost A similar kitchen would cost around £17,000. ‘Although we were still in London when the house was built, we were able to have input in the later stages when the interior was being finished off, as we’d moved in with my mum by then,' says Lucinda. ‘We were supposed to be there for five weeks but it turned into five months. If we’d gone with the builder’s spec on everything, it might not have overrun as much, but we wanted to upgrade lots of things. For instance, the Bert & May floor tiles for the hall took 12 weeks to arrive, holding up the installation of the stairs. and fell in love with their Shaker-style kitchens – that was my inspiration. ‘Having lived in cities all our lives, we could never really go rustic, but here we’re surrounded by woodland with four peacocks next door. This led me to pick natural oak parquet flooring, dark green Shaker units with antique bronze handles and a Belfast sink. ‘The developer put us in touch with a local fitter, Simply Insignia in Preston. They showed us four kitchens in about five different colours, many of them grey. When I said I wanted dark green and brass, they told us it wasn’t in fashion! 'I think they were a little taken aback when we asked for so many changes. However, in the end they really worked with us and let us go more bespoke. We paid a bit more to get the units painted in Farrow & Ball’s Green Smoke, and chose our own tiles and flooring. They also suggested having the doors on the tall cupboards fitted in a larder style, which works much better. ‘Luckily I bumped into an old friend who has a small interiors shop called JF Interiors, and she had loads of wallpaper to choose from. I fell in love with the Miami design by Cole & Son as it works perfectly with the colour of the tiles and units. At one point we considered putting shelves on either side of the oven, but it would’ve been a shame to cover the lovely wallpaper. ‘Friends and family love the new kitchen – it’s so sociable. In summer we open the doors to the courtyard garden, and the whole family comes round at Christmas. I spend time on the sofa gazing at the sky. It sounds trippy, but it’s something I couldn’t do in London. ‘We’re still a bit overwhelmed by it. Our utility room is bigger than our previous kitchen so we have more space than we’ve ever had. Flooring The Natural Wood Floor Co. Inspired to create a similar kitchen?